Emily Martin’s Pantone Postcard Project, and its archives, are becoming a part of the special collections at the Library of Congress (Washington, DC). 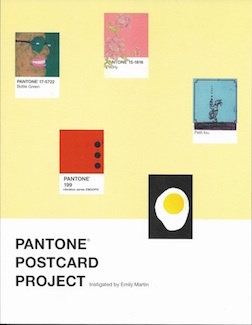 The Pantone Postcard Project was started in 2013, when Emily Martin sent postcards to 99 other makers throughout the US, Canada, Italy, Chile, and the United Kingdom to respond to the color they received, do something to the card and return it through the US postal service. In 2015, the postcards were on exhibit from June 15 to July 3 at the St. Bride’s Foundation gallery in London (United Kingdom). 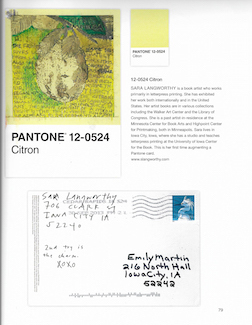 The Pantone Postcard Project’s catalog shows all 100 cards, front and back, with biographical information on each maker and a thumbnail image of the original card. Its foreword is by Mark Dimunation, Chief of Rare Books at the Library of Congress, and the preface is by Martin herself. The catalogue was designed by fellow UICB faculty member Sara Sauers. 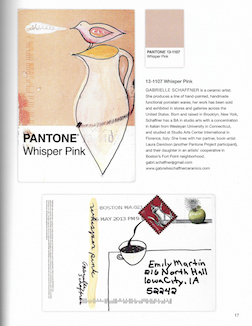 For more information on the Pantone Postcard Project, check out the following link. Emily Martin is a professor in the disciplines of Book Binding and Artists Books at the UICB. She is the founder of Naughty Dog Press (1996). Her books are included in public and private collections throughout the United States and internationally, including the Metropolitan Museum of Art (New York), the Museum of Modern Art (New York), The Victoria and Albert Museum (London), The Museum of Contemporary Art of Chicago, The Marvin and Ruth Sackner Archive of Concrete and Visual Poetry (Miami Beach, Florida), and the Tate Britain (London). © The University of Iowa 2005-2019. All rights reserved.